There are now over 2.7 billion active accounts on social media, which makes up 74% of all internet users. With stats like these, it’s clear that social media has come to dominate the online space. If you don’t create a social media presence for your blog, you’re confining yourself to a corner of the internet rather than participating in the larger conversation around you. Fortunately, it’s easier than ever to use social media as a marketing platform. This is particularly true if you’re using WordPress, since the platform gives you access to plenty of helpful plugins. If you take the time to do a little research, develop a clear plan of action, and find the right supporting tools, you’ll able to market your content and foster reader engagement with confidence. In this article, we’ll discuss what social media can do for you, then walk you through four steps to create a social media presence for your WordPress blog. Let’s get started! It should come as no surprise that more people are using social media now than ever before. For example, in the U.S., the percentage of the population using one or more social media sites has risen from 7% to 65% over the past decade. The figures are even higher when you filter out those who don’t use the internet at all. Promoting your blog posts through social media gives you access to a wider audience. Increasing engagement. Social media enables readers to comment on, add to, and share your content, which will strengthen their connection to it. Bringing in new traffic. Instead of relying on new readers to find you through search engines, you can attract them via social media shares. Improving your recognition and authority. Seeing your content appear all across the internet will encourage people to view your blog as prominent and reliable. With benefits like these, how can you afford to not create a social media presence? Of course, the fact you run a WordPress blog already gives you a lead on the competition. Using WordPress gives you access to a variety of useful social media tools, some of which we’ll discuss in greater detail below. Now you understand the importance of creating your own social media presence, it’s time to find out how. 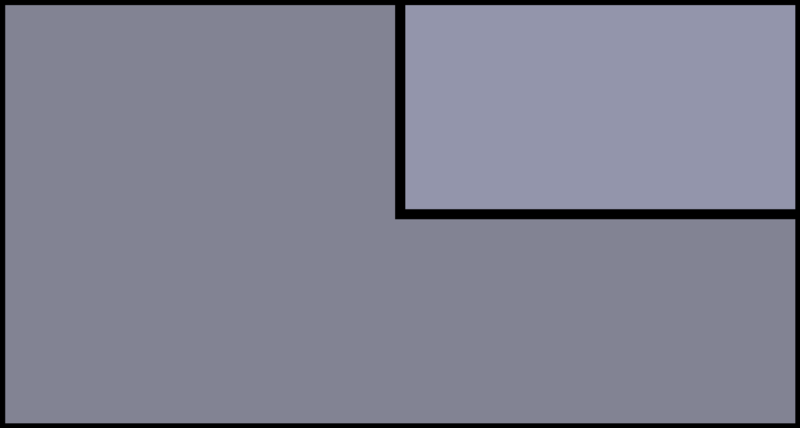 The following four steps are those you can begin taking right away. There are a lot of social media platforms, many of which are widely used. The top five sites – Facebook, YouTube, Instagram, Twitter, and Reddit – each have between 250 million and 2 billion monthly visitors. In an ideal world, you would be able to share your content on all of these platforms. Facebook is still by far the most popular social media platform. However, time and resource constraints will likely prevent you from doing that. Instead, you’re best off narrowing in on a few key networks where you can focus your efforts. If you haven’t done so already, you’ll want to start by defining your target audience. After that, you’ll need to figure out which platforms your audience uses the most. These are the social media networks that will bring the highest returns on your investment. There are a number of ways to find this information, including online research, demographic data, and surveys of your existing readers. The social media sites your audience prefers should become your primary targets. However, it’s also worth considering the most popular platforms as well. Even if your audience doesn’t seem to spend a lot of time on Facebook, its near two billion users are still worth reaching out to if you have the time. If you followed the advice in the first step, you should now have a shortlist of social media networks to target with your content. However, you don’t want to spend a lot of time doing so. You already work hard creating content for your blog, and manually sharing it is hardly the most efficient use of your time. 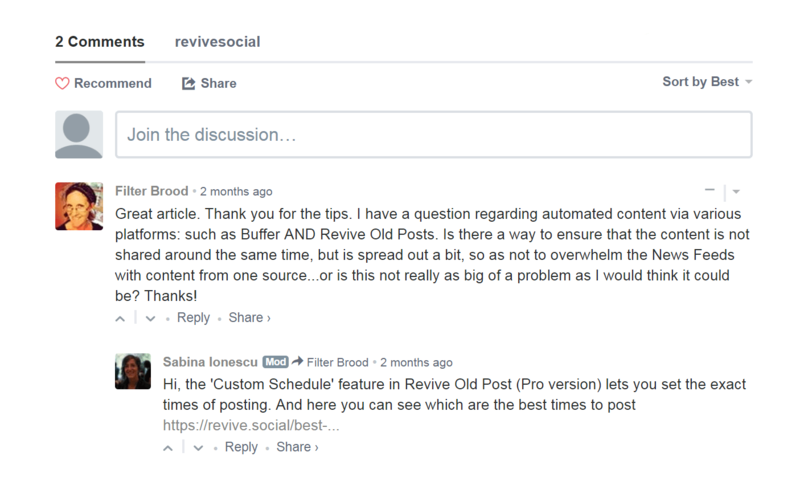 Revive Old Post enables you to automate sharing your content on social media sites. The solution to this dilemma is automation. You can use your blog’s content to create a social media presence by sharing it to your target networks automatically. What’s more, as a WordPress user, you can do this quite easily with plugins. There’s a social media automation plugin available for almost any platform, although you’ll want to take care with your selections and make sure you’re choosing reliable options. If you’re not sure where to start, Jetpack is a solid choice that will take care of sharing your content on several of the most popular social media sites. 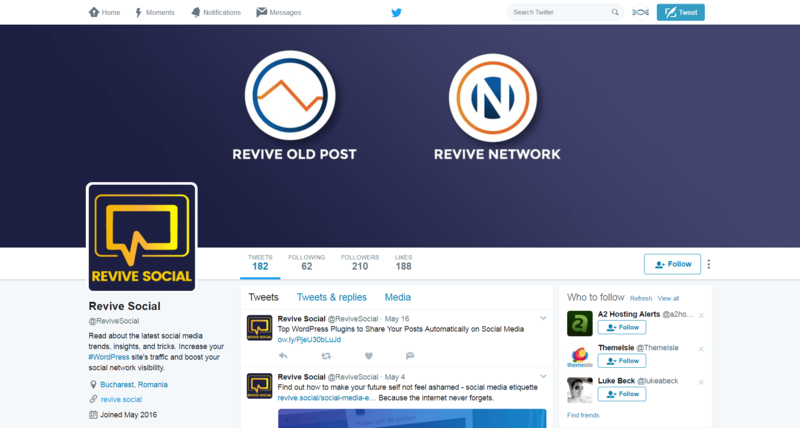 We also recommend our own Revive Old Post and Revive Network plugins, which will share your own blog posts and relevant third-party content respectively. Both are simple to use, and will help you generate more traffic with little effort on your part. Of course, there are also non-plugin tools that are worth checking out. For example, Buffer enables you to schedule social media posts in advance – while you do have to add content yourself, it automates the posting of your content. As we mentioned earlier, social media is all about promoting conversation. It’s a two-way street, so you don’t want to stop at simply sharing your own content. In one study, 71% of consumers said if they had a positive social media experience with a particular brand, they would recommend it to other people. Therefore, the real goal is to encourage your audience to become active participants and do some of the marketing work for you. You’ll need to provide them with the tools they need to share your content themselves. Once again, the best way to do this is with plugins. There are many different plugins that enable you to add social media sharing buttons to your site. Monarch, for example, lets you put social icons in your sidebar and widget areas. However, this plugin requires a membership, so you might also consider Easy Social Share Buttons For WordPress, which offers a lot of features for a fairly low price. Finally, if you chose to pick up Jetpack to automate your content sharing, it also features a simple way to add social media icons to your site. If you followed the previous three steps, you’ll be well positioned to share your content via social media and encourage your readers to do the same. However, there’s one final piece of the puzzle – remaining a part of the ongoing conversation. Rather than simply sharing your posts and forgetting about them, it’s a smart idea to watch your chosen social media platforms and respond to readers’ comments. Responding to reader comments, concerns, and questions is vital. Engaging with your audience this way fosters strong relationships, and is expected by social network users. In fact, in one study, about a quarter of those surveyed responded that if their responses on social media sites were ignored, they would feel less brand loyalty, be less likely to use a company’s products or services, and be more likely to switch to a competitor. Respond as quickly as possible. Most social media users expect to wait 4 hours or less to hear back from you. Reply to as many people as you can. Everyone wants to feel heard, so you’re better off composing short responses to a lot of users rather than long responses to only a few. Remain positive. Even when replying to negative feedback or criticism, aim to keep the conversation from turning into a conflict. We won’t pretend it doesn’t take some work to create and maintain a strong social media presence. However, if you keep at it and remain a consistent part of the conversation surrounding your content, you’ll be building a relationship with your audience that will result in numerous benefits. 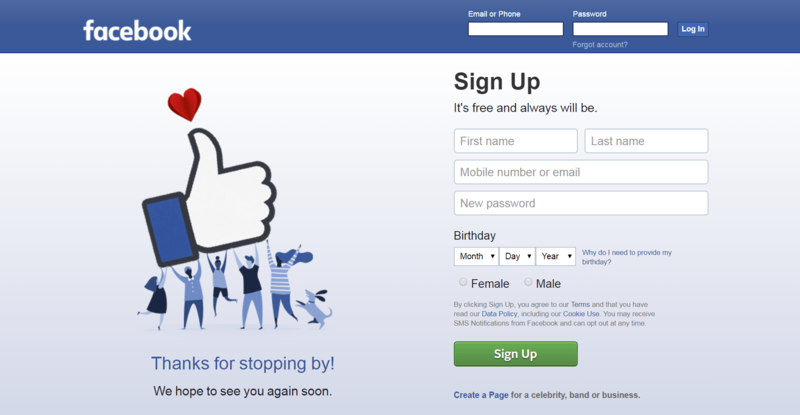 In the U.S. alone, more than 76% of Facebook users are active on the network daily. That’s why social media platforms can be a goldmine for any blog owner. They can help you find new readers, and foster deeper connections with your existing audience. Sharing your content across social media (along with encouraging participation and engagement) helps position your blog at the center of the conversation. Choose the right platforms to focus on. Select the right automation tools. Add sharing buttons to your site. Remain an active part of the conversation. Do you have any questions about how to use social media to share and market your content? Ask away in the comments section below! The information in this article is quite comprehensive and helpful. It’s great to have the posting time already planned and scheduled especially for bloggers and online marketers though. I would like to recommend the use of social media management tools in order to ensure efficiency in this regard. The one that i have been using for my blogs is Social Champ-a one-stop place to create, post, schedule, and analyze all of your social media efforts – eliminating the monotonous task of having to switch tabs between dozens of accounts. It enables you to have a controlled stream of all your blogs, promotional/awareness campaigns, print advertisements and a lot more on different networking channels at the same time. It is the first tool that allows you to automate the repetition of your posts according to your self-designed schedule in order to reinforce your marketing strategy and maximize the number of views.